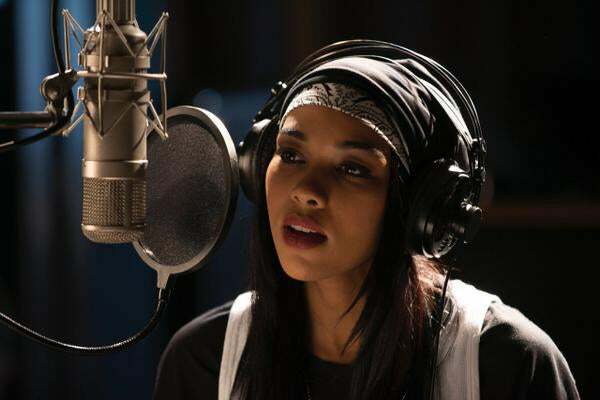 Love it or hate it, there were some interesting tidbits we learned from the portrayal of Aaliyah’s life on screen. Aaliyah Princess of R&B starring Alexandra Shipp premiered on Lifetime tonight. Love it or hate it, we can’t deny that there were some interesting tidbits we learned from the portrayal of Aaliyah’s life on screen. After her parents annulled her marriage to R. Kelly, a heartbroken Aaliyah took over five years to move on. “”How is taking Robert out of my life protecting me?” Aaliyah asks her parents. “When I ended things with Robert, I lost a piece of me,” she tells her mother in the film. “And I’m scared of it happening again.” In the film Aaliyah is shown getting upset when she hears Kelly has married his backup dancer Andrea Kelly, who now stars in VH1’s Hollywood Exes. Aaliyah does eventually find happiness again with Damon Dash (played by Anthony Grant). That relationship went on until her death in the plane crash on August 25, 2001. And no one was going to change that. The film shows Aaliyah rejecting the glittery, body fitting dresses her record company tried to make her wear during one of her first photo shoots. “These clothes are so far away from who I really am, people will think I’m fake,” she says. “The only time I wear a dress or a skirt is when I go to church. If Jive is going to spend so much money on clothes, at least make it unique.” The songstress signature baggy jeans and exposed abdomen—not to mention the hair-over-the-eye swoop—were the way she preferred to express her unique style and sexuality. The “man from the big VA” was not always the most in demand producer in the game. Neither was his partner in crime, Missy Elliot. Aaliyah had to nearly beg her label for the chance to work with the music production duo who would later produce her last two multi-platinum albums, One In A Million and Aaliyah. “Timbaland and Missy Elliot are like nothing on the radio right now. I know that if you put us in this studio together we are going to create something crazy.” At the time, Timbaland and Missy, portrayed by Izaak Smith and Chattrisse Dolabaille respectively, were no names out of Hampton Roads, VA and in the film, they seemed nervous to work with an established star. But Aaliyah had faith in them and as we know, the rest is Hip-Hop and R&B history. As the famous rumor goes, Aaliyah had a glass eye and that’s why she wore always sunglasses. Early in the movie we see R. Kelly giving her a pair of sunglasses as the cherry on top for her new look. Throughout the film we see that the singer had perfectly good eyes, which she began showing when she dropped her second album dropped in 1996. In fact, her signature style of covering her left eye was encouraged by her mother who said it would add a little “mystery.” The look was inspired by actress Veronica Lake. The singer reportedly maintained a 4.0 grade point average while attending Detroit’s prestigious High School of Fine and Performing Arts. In a scene in the movie, her brother Rashad jokes: “If things don’t work out you’ll make my life easier by being a normal teenager again. And who knows, you might even get a B or C someday.” She also stuck to her studies while she was on tour, seen in the film lugging around math books while getting her makeup done. Aaliyah performed the song “Journey to the Past” at the 1997 Academy Awards. The song, from the animated movie, Anastasia, was up for Best Song—up against “My Heart Will Go On” from Titanic. The song didn’t win, but Aaliyah got to perform it at 19 years old, making her the youngest musical performer at the Oscars.